Austrian insurer VIENNA Insurance Group shows strong resilience in the latest EIOPA stress test, in all three quantitative test scenarios, VIG achieving results of between 158% and 215% including the volatility adjustment - well above the required minimum solvency ratio of 100%, the company announced in a statement. Romanian insurers ended the first three quarters of 2018 with GWP worth EUR 1.6 billion, 0.7% up y-o-y, while paid claims have increased by 13.1%, to EUR 918 million. Given the national currency's depreciation against Euro, the results denominated in RON show a better dynamics. The nine months report on insurers' performance published by the Insurance Association of Cyprus (IAC), shows that at the end of September 2018 the local insurance market totaled EUR 651 million in premiums, up by 7.2% y-o-y. On 18 December, in the 17th arrondissement of Paris, AXA has inaugurated "JAVA", its new global center dedicated to innovation, data and emerging technologies. According to preliminary sigma estimates, total economic losses from natural and man-made catastrophes in 2018 declined to USD 155 billion from USD 350 billion in 2017. Global insured losses are estimated to be around USD 79 billion, higher than the annual average of the previous 10 years. The Azeri Association of Insurers of (ASA) announced the results of the rating action considering insurance companies' level of service and customer attitude for November, according to the ASA official statement. According to Devi KHECHINASHVILI, Chairman of the Board, Georgian Insurance Association, Bank of Georgia is creating its own insurance company. The new insurer already received a permission from the National Bank and is going to apply to the State Insurance Supervision Service. The conference aims to involve all the?relevant stakeholders?to identify the most appropriate solutions for the market's growth and to attract the investments and know-how, taking also into consideration the latest practices and other countries' experience. As already stated (link la http://xprimm.com/Green-line-for-EUROINS-to-acquire-Georgian-insurer-IC-Group-articol-2,12,47-12012.htm) in September by EUROINS Insurance Group (EIG), Georgian insurer IC Group has become a member of the Bulgaria based group. EIG owns over 51% of the Georgian insurer. For 9 months this year Russian insurers generated GWP in the amount of RUB 1.093 trillion (+13.65% y-o-y). In European currency, due to significant depreciation of the local currency against euro, the market growth looks much more moderate - only 2.05%, according the Bank of Russia data. According to the Bank of Russia data, for 9 months this year insurers with foreign participation generated GWP in the amount of RUB 206.4 billion, which is almost equal to 19% of the total market premiums for the period. For 9 months of 2018 Tajik insurers generated GWP in the amount of TJS 141.97 million (EUR 13.32 million), TJS 34.01 million from which were ceded in reinsurance (in voluntary classes only), as the data of the National Bank of Tajikistan show. 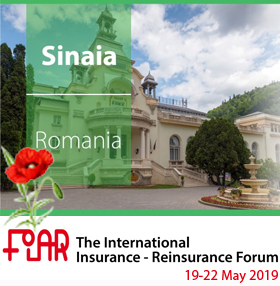 To the satisfaction of its traditional guests, FIAR returns in 2019 to its historical hometown, Sinaia. Yet, the forthcoming edition will benefit from the comfort and professional facilities of a new venue, the Conference Center of the International Hotel ****, located in the heart of the beautiful mountain resort.